In World Language petroglyphs, pictographs and ancient symbols from the seven continents are swirling, spiraling out of a conch shell. 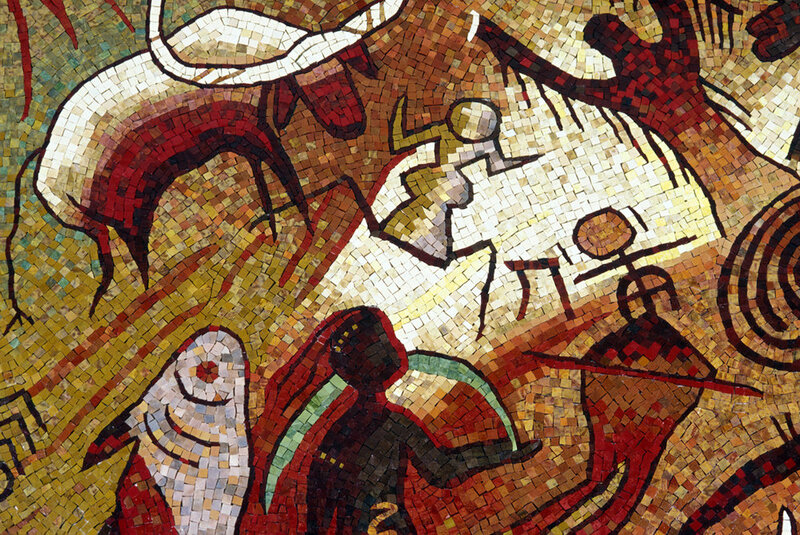 These images symbolize the many languages and cultures of the world at our most common time, our ancient origins. 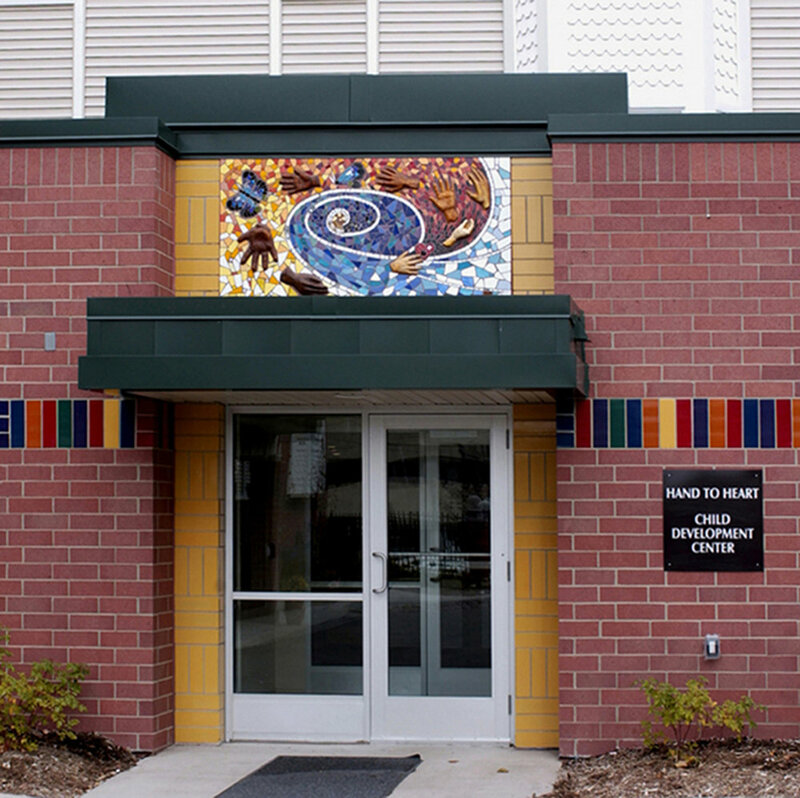 Three women are honored in this mosaic for organizing in a low income neighborhood on the near north side of Minneapolis. The women organized (before any of these programs were common place): a food shelf, a day care center, a college bound program and a support network for single moms. The candles in the house signify the three women and their light to the community. The butterflies- transition and change, the phoenix at the top- the notion that we can recreate ourselves, signifying the tearing down of the mold infested housing and the building of this new building; a welcoming home for seniors from the neighborhood. 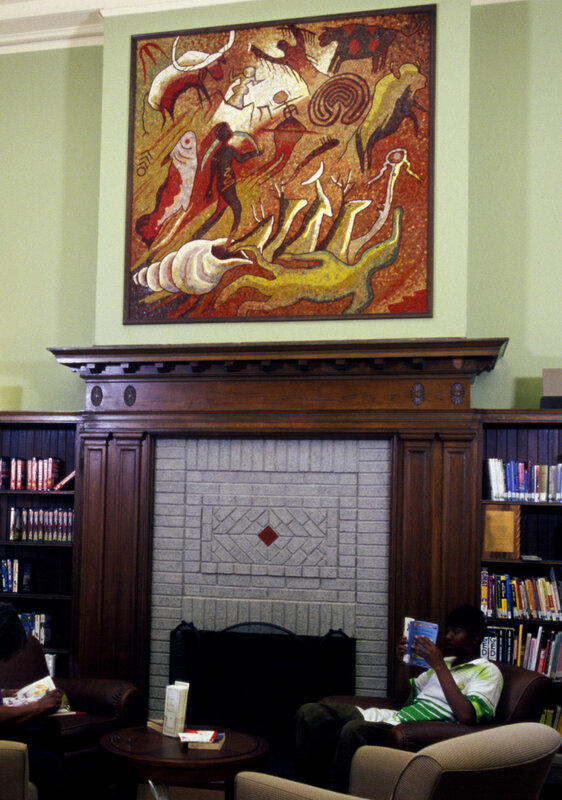 "Hand to Heart" Mosaic series, lead by artist Marilyn Lindstrom with artist Malichansouk Kouanchao was created with the participation of the single mother residents of the Jeremiah Program. The child's hand touches the heart, symbolizing that having heart, having compassion is at the center of success and recovery. The many diverse hands show that we are all related and need each other to fullfill our dreams. The blue butterfly,as transition and change, a belief in the power of each of us to reach up and fly.